“After 17 years of Blackbird ownership I still absolutely love them,” says John Smith. “I must have owned more than 20 – though quite a few were just bought and sold on. But I’d say I’ve had eight that were ‘my own’ bikes. My current Bird is a 1998 model, but I have modified it a bit. It’s still a Blackbird though. “It wasn’t love at first sight I must admit. I bought the first one on a whim. I was going on a trip to Italy in 1998 and I had a Yamaha YZF750R-SP at the time. I thought I’d be holding everyone up stopping for fuel, so I went to Lings Honda and a tested a VFR800. I hated it and took it back after 40 miles. Then I spotted this huge black bike and asked what it was. The salesman explained it was a Blackbird and I asked what they were like. I know the guys at Lings well and, when they told me the Blackbird was pretty good, I bought it without even riding it. “At first, I hated it. I thought: ‘I’ve bought a bloody barge here.’ But, early the next year, I went on a trip to France with my son. He was on his R6 and I was on the Bird – still hating it. Something clicked though. I wore away the hero blobs on the footrests, took a bit off the stand and scuffed both sides of the fairing lowers. I’m just an average rider, so I realised just how competent the Blackbird was. “The Blackbird is an amazing all-rounder and I can’t think of another bike that would tick all the boxes for me. I’ve done plenty of trackdays on them – mostly at Donington and Snetterton – and can hold my own. And I’ve competed at ‘run what ya brung’ sprints on drag strips and clocked an 11-sec run. I’ve even got a timing slip for 184.6mph from one of the ‘High Speed Days’ Performance Bikes used to run. “I commuted daily on one of my Blackbirds for four years and I’ve ridden them on countless continental trips. The carburetted bikes are better and a little quicker, in my opinion. It’s the carburettor models that seem to be the most sought-after now. “I once got separated from the group coming back from a rally on Lake Garda in Italy. There was no sat-nav back then, so I just pressed on trying to catch up. Before I knew it, I was in Calais. I got home to Norfolk at about 4am, unloaded the bike and had some breakfast. No-one at home had got up by 5.30am, so I got bored and went out for a ride. I can’t think of another bike that would make you feel like doing that. “By 2001, I’d got so into Blackbirds that, when I got made redundant, I decided to set up a firm (www.jaws-motorcycles.co.uk) to look after the bikes and market some quality parts for them. I’d already made some crash bobbins after I’d bought some for £20 that I thought were rubbish. Other owners started asking me to make things for them, so I took the plunge. I eventually sold the business last year, but I still do some work for the new owners and provide technical advice. That’s how the Blackbird gets to you. I can’t leave them alone. The aerodynamics of the carefully sculpted bodywork, and light weight are two of the keys to the Blackbird’s impressive turn of speed. The 137bhp, 1137cc engine had a bit to do with it too. 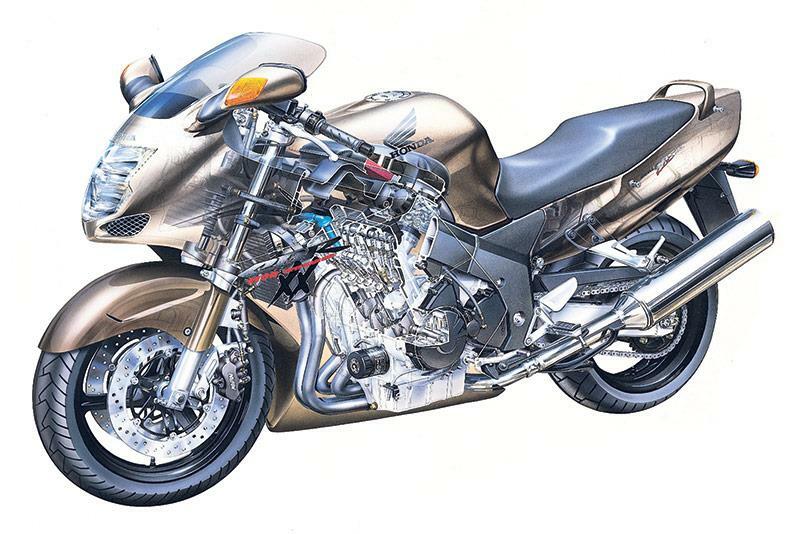 Introduced in 1996 the CBR1100XX-V is touted as the world’s fastest production bike. The first major change was fuel injection in 1999. After that year, the only thing was a digital dash and altered EFI mapping. Production ceased in 2007. A clattering camchain is common after as little as 8000 miles. The tensioners used on the fuel-injected bikes are a little better but the solution is to fit a redesigned aftermarket tensioner (£45, www.jaws-motorcycles.co.uk). The stock fork springs on the Blackbird are progressive type with fairly long spacers. Linear springs with shorter spacers work much better. A spring kit costs just £94 and makes a sensible investment. The Blackbird’s standard rear shock will be trashed after less than 20,000 miles, so if you are buying used budget for a rebuild by Jaws Motorcycles at £120 – a fraction of the cost of a replacement shock. The regulator-rectifier unit can be another source of problems, but £78 will get you a new one. The battery condition can also play a part in shortening the life of both the alternator and reg/rec by overworking the charging system. The alternator is one of the few weaknesses on the Blackbird and Honda never really addressed the problem of it overheating. It’s mostly EFI models that suffer. An improved aftermarket stator only costs £85.